Dan Whitney is part of the team working on the NASA HIAD project. Students in all stages of their undergraduate and graduate education come to the UMaine Composites Center for hands on research experience. 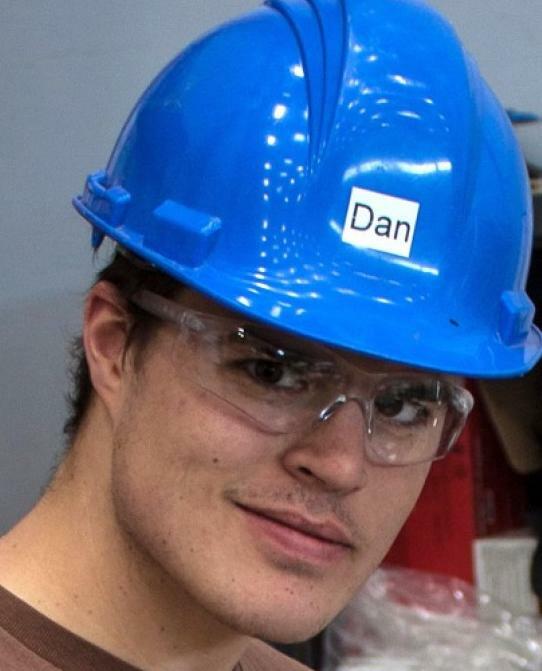 Dan Whitney, a graduate student from Topsham, Maine, has applied his composites experience to various projects around the center. Whitney earned his BS in Engineering Physics from UMaine while working at the center as a student research assistant. He decided to return to the center as a graduate researcher while working towards his MS in Mechanical Engineering. Whitney first began working at the center in 2011. “I had a friend who worked on the Secure Hybrid Composite Shipping Container project and knew Josh Clapp. That summer I was doing research at the LASST lab. I got wind that they needed some help at the center, so I applied,” Whitney said. After being hired, Whitney began to work on the container project, gaining valuable experience with infusing composites. He used this experience on multiple other projects, including the ongoing Composite Arch Bridge research efforts. Whitney has also worked on various programming tasks for multiple projects, including the NASA HIAD (Hypersonic Inflatable Aerodynamic Decelerator). These projects have required Whitney to use MATLAB and finite element modeling. This work on the NASA project is important to Whitney, because he wants to pursue a career in aerospace after he earns his MS.
“I would like to work in the aerospace industry. I love the stuff NASA does, so it would be fun to get to do something like that,” Whitney said. NASA is one of many high profile clients that have relied on the center’s experience in research and testing. After working at the center for almost four years, Whitney has enjoyed getting hands on experience in a field that he has a passion for.